QUALITY, PRODUCTIVITY, INNOVATION AND LOWER MAINTENANCE COSTS. The Eureka E85 scrubber dryer is an innovative ride on scrubber-dryer, extremely robust and efficient, engineered to guarantee exceptional performances even in the toughest industrial environments. With its compact size and maneuverability, the E85 provides unmatched performance in commercial areas. The E85 has been designed to ensure operator comfort, with simple and intuitive controls, high maneuverability and excellent visibility. It is therefore extremely safe and easy to use, even by less experienced operators. 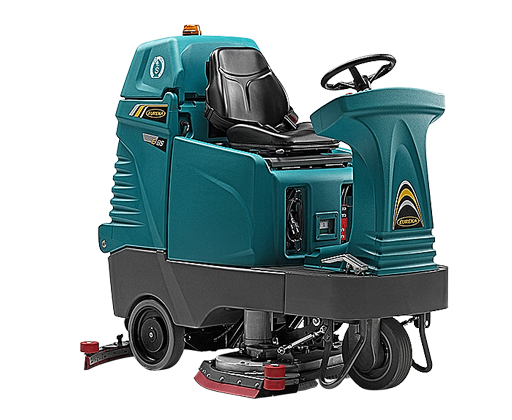 Its extremely low noise level makes the E85 the ideal machine for cleaning at any time, in any type of building. The E85, equipped with the exclusive ECOsystem®, provides savings up to 80% compared to conventional machines, and, thanks to the high quality of materials used, is robust and reliable, ensuring a significant reduction in maintenance costs.